Developing a multiple mental awareness has some distinct advantages. Insurance statistics verify that there is a higher percentage of people who have auto accidents with telephones in the car than people with cars that don't have phones! Splitting one's attention between conversing on the phone and driving can be a little difficult for people. Increasing your overall awareness is important. If different words are simultaneously played through a headset to the left and right ears, you tend to hear and report better those words heard by the right ear (left brain). If different, non-speech sounds are played into both ears, the left ear (right brain) tends to acknowledge the sound better. To avoid having a sensory overload when two people are talking to you at once, practice listening to the radio and TV at the same time, or two radios or two TV's. Discern each conversation individually and get the gist of what is being said from both inputs. Translators at the United Nations often listen and translate simultaneously. Traffic control operators who guide airplanes with airport radar become very good at discerning simultaneous conversations coming in through their headsets. It's a matter of life or death for many passengers. Behind a closed door, pick out the different human voices conversing at a party in the next room. You'll probably find it easy to discern the voices of family members and close friends, but have more difficulty with voices you've heard only a few times. Listen for the pitch, the inflection, the pattern, and the tempo of the voice. Pick up on the idiosyncrasies -- clearing of the throat, sniffling, stuttering, etc. Seat yourself in a room where conversations are going on and close your eyes. Flash rapidly from one conversation to another, getting the flow of each by picking up key words and ideas. Now converse with someone while listening to a conversation behind you. With practice, this ability will become a lot of fun and you'll find that you'll miss very little of what's going on around you. Practice this in a restaurant with a friend or while walking down a city street. In the beginning, you will consciously have to attend to this process, but later it will require less effort and become more natural to open up your mind to a combination of auditory inputs. Tune in your favorite soap opera or TV show and turn your back to the screen. Pick out and discern the various voices. Identify the movie actors or speakers and then check to see whether you are right or wrong. Practice also conversing while listening to TV or radio conversations for a more multiple awareness. The more you practice, the more adept at it you'll become. With 2 tape recorders and 2 headsets, experiment with 2 voice tapes by putting half of each headset on each ear. Vary the volume into each ear and listen to both conversations simultaneously. If an emotionally provocative story is played for the left ear (which primarily goes to the right brain), and an analytical dissertation is played for the right ear (which goes to the left brain), assimilation will be greatly facilitated. 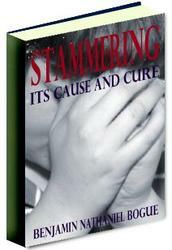 This book discusses the futility of curing stammering by common means. 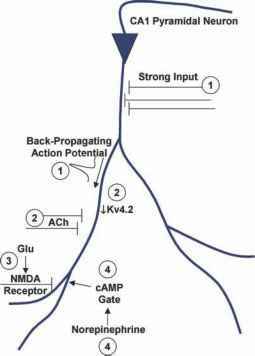 It traces various attempts at curing stammering in the past and how wasteful these attempt were, until he discovered a simple program to cure it. The book presents the life of Benjamin Nathaniel Bogue and his struggles with the handicap. Bogue devotes a great deal of text to explain the handicap of stammering, its effects on the body and psychology of the sufferer, and its cure.